DAKAR, Senegal -- Rebels attacked a United Nations peacekeeping base in eastern Congo, killing at least 14 peacekeepers and wounding 53 others in the deadliest single assault on a U.N. mission in recent history, officials said Friday. Jean-Pierre Lacroix said he was "outraged" by the attack, saying on Twitter that medical evacuations were ongoing from the scene. The peacekeepers were mainly from Tanzania. At least five Congolese soldiers also were killed in the attack Thursday evening that was blamed on one of the region's deadliest rebel groups. "It's a very huge attack, certainly the worst in recent memory," deputy U.N. spokesman Farhan Haq said. The U.N. peacekeeping mission in Congo is the largest and most expensive in the world and is aimed at calming a number of armed groups in the vast, mineral-rich Central African nation. U.N. Secretary-General Antonio Guterres called the attack "a war crime" and urged Congolese authorities to swiftly investigate. He expressed "outrage and utter heartbreak." At least 70 armed groups are fighting in the eastern part of the country, CBS News' Pamela Falk reports from the U.N. Despite the presence of thousands of peacekeepers, the stronger militant groups in the region terrorize communities and control weakly governed areas of the country where millions of civilians have been forced to flee the fighting. The peacekeeping base is located about 27 miles from the town of Beni, which has been repeatedly hit by the Allied Democratic Forces rebel group. The base is home to the mission's rapid intervention force, which has a rare mandate to go on the offensive, according to the U.N.-supported Radio Okapi. The radio station, citing military sources, said the fighting lasted four hours. 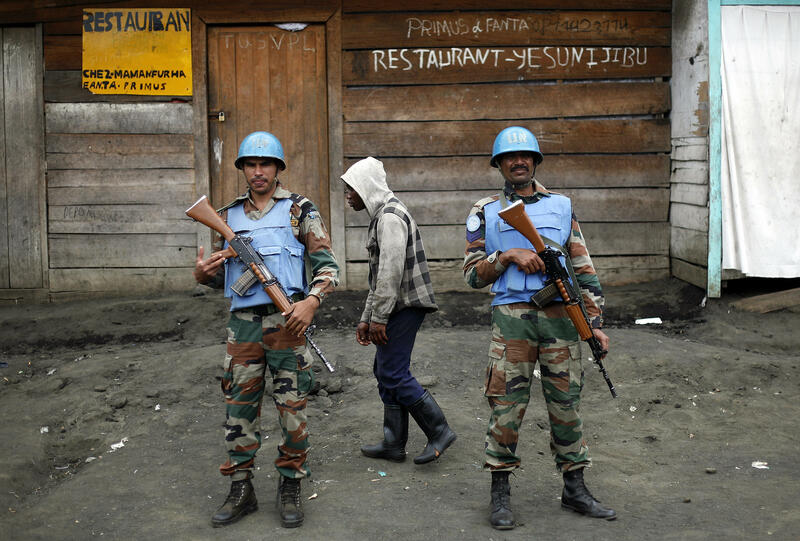 Nearly 300 peacekeepers have been killed since the U.N. mission arrived in Congo in 1999, according to peacekeeping data. Congo, a country the size of Western Europe, has seen immeasurable cruelty and greed as a result of its vast mineral resources. The nation suffered through one of the most brutal colonial reigns ever known before undergoing decades of corrupt dictatorship. Back-to-back civil wars later drew in a number of neighboring countries. Many rebel groups have come and gone during the U.N. mission's years of operation, at times invading the regional capital, Goma. One of the greatest threats now comes from the ADF. The rebels once aimed to overthrow President Yoweri Museveni's regime in neighboring Uganda. By the 1990s, they had established themselves in Congo. While the fighters are mainly Muslim, experts say there are no proven links between the rebels and other extremist organizations in Africa.